Three CURE members Connecting Us to a clean energy future! Three CURE members—Brad Blue, Marsha Van Denburgh, and James Nelson—are poised to make history and advance clean energy and democracy in Minnesota by running to unseat the incumbents on the Connexus Energy board of directors. Brad, Marsha, and James are running on a platform of cooperative democracy (democratic member control), clean energy and grid innovation, and good governance, transparency, and accountability. They are also supported by Connecting Us, an electric co-op member-owner advocacy a group that wants to increase total voter turnout and educate members about its slate candidates and the major co-op issues. CURE is a supporting partner of Connecting Us. Connexus Energy is Minnesota’s largest electric cooperative and the second largest in the country. Connexus has 133,000 member-owners. It serves the north metro area and stretches from the Wisconsin border to St. Cloud. By design, It’s members own and democratically govern Connexus Energy. However, voter turnout in Connexus elections is shamefully low. Less than 7% of Connexus’ member-owners vote in co-op elections and the co-op has done little to educate members on how to get involved. Regularly talking with and listening to fellow co-op members is a big part of being a good board director. This is a bedrock principle of democratic member control, and the Connecting Us candidates know this well. “I pledge that I will have an open door for listening to our members’ ideas and concerns,” stated James. Brad continued, “I am committed to making information transparent and accessible so that member-owners can make important decisions about energy much more easily.” Marsha sees serving her fellow members as an honor. She commented, “I’m excited to serve all member-owners by listening to their concerns and presenting opportunities to move forward with renewable sources and a wide portfolio of energy options.” To show that they take their pledges seriously, the candidates have already made their email addresses public—none of the incumbent Connexus board of director members do this. The Connecting Us candidates have also hosted a “Meet the Candidates” event at Invictus Brewing and a Facebook live event on the Connecting Us page to talk with other co-op members. 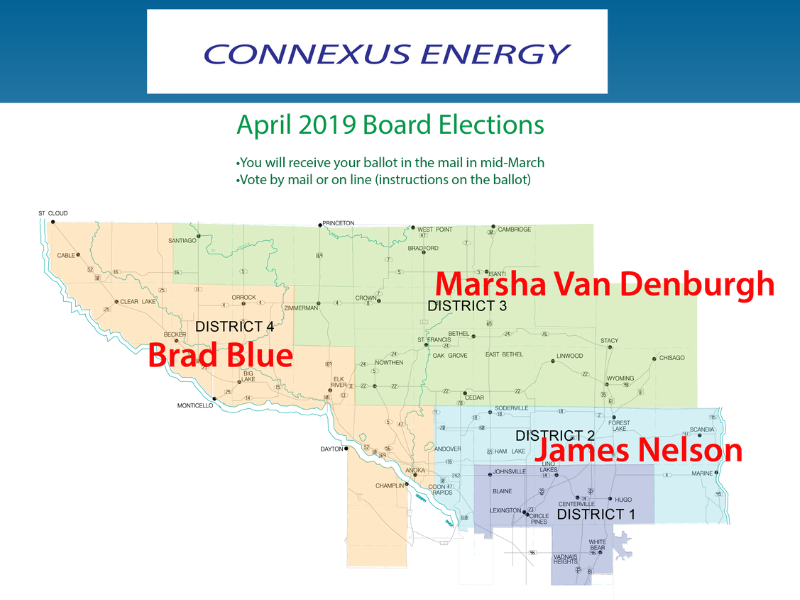 If you get your electricity from Connexus, you can use your three votes to help elect Brad, Marsha, and James to the Connexus board of directors and advance Energy Democracy in Minnesota! Learn more about the candidates and Connecting Us here. Connexus Energy is the largest electric co-op in Minnesota serving 133,000 people in the North Metro—from St. Cloud to Marine on St. Croix. Though US solar power industry has seen a growth in few years, the share of solar power generated is low. Positive changes at the organizational level, may help bring a positive impact at grass root levels.